Business vs. 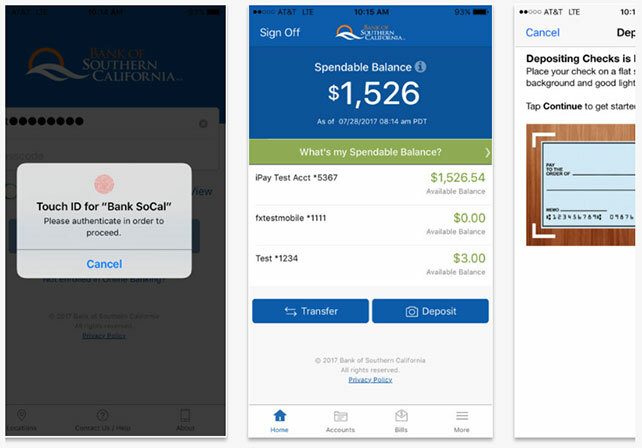 Personal Online and Mobile Banking - Bank of Southern California N.A. One of the perks of being a member of Bank of Southern California is the ability to use our online and mobile banking features. With both online and mobile banking, you receive 24/7 access to your accounts and the ability to perform a variety of banking transactions anytime, anywhere. We do not charge a monthly fee or per account charges unlike most major banks, which makes your banking always accessible and easier. For personal online and mobile banking, we offer you all the same daily activity transactions features as our business online and mobile banking. Most if not all your banking needs can be done without ever stepping foot into the bank! If you are already a customer of ours and wish to enroll in online banking, click here and then select “Personal Enroll.” If you would like to go mobile as well, you can download our app in the App Store or Google Play. We are always here to answer your online and mobile banking questions, so please contact us.